(1) Jang, C. M., Furukawa, M., and Inoue, M., Analysis of vortical flow field in a propeller fan by LDV measurements and LES-PART I : Three-dimensional vortical flow structures, Transactions of the ASME, Journal of Fluids Engineering, Vol.123, No.4 (2001a), pp.748-754. 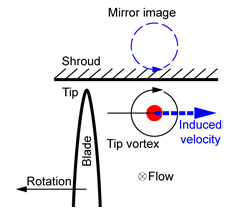 (2) Jang, C. M., Furukawa, M., and Inoue, M., Analysis of vortical flow field in a propeller fan by LDV measurements and LES-PART II : Unsteady nature of vortical flow structures due to tip vortex breakdown, Transactions of the ASME, Journal of Fluids Engineering, Vol.123, No.4 (2001b), pp.755-761. (3) 深野徹, 福原稔, 川越和浩, 原義則, 木下歓治朗, プロペラファンの低騒音化に関する実験的研究（第1報，空力特性）, 日本機械学会論文集B編, Vol. 56, No. 531 (1990a), pp. 174-178. (4) 深野徹, 福原稔, 川越和浩, 原義則, 木下歓治朗, プロペラファンの低騒音化に関する実験的研究（第2報，騒音特性）, 日本機械学会論文集B編, Vol. 56, No. 531 (1990b), pp. 179-184. (5) 近藤文男, 山口信行, 青木美昭, 新田堯, 空調用プロペラファンの騒音低減, ターボ機械, Vol. 19, No. 6 (1991), pp. 19-26. (6) Akaike, S. and Kikuyama, K., Noise reduction of pressure type fans for automobile air conditioners, Transactions of the ASME, Journal of Vibration and Acoustics, Vol. 115, No. 2 (1993), pp.216-220. (7) 塩見憲正, 金子賢二, 蔡文新, 佐々木慶介，瀬戸口俊明, 開放型軸流ファンにおける翼先端渦の特性, ターボ機械, Vol. 31, No. 9 (2004), pp. 545-553. (8) 中島誠治, 山田彰二, 吉瀬幸司, プロペラファン周りの流れ場と騒音の関係に関する実験的研究（作動点による翼端流れ挙動の違いと騒音の関係について）, 日本機械学会論文集B編, Vol. 76, No. 767 (2010), pp. 32-37. (9) 草野和也, 古川雅人, 山田和豊, 半開放形プロペラファンにおける翼端渦の三次元構造, 日本機械学会論文集, Vol. 80, No. 810 (2014), p. FE0024. 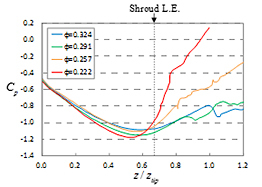 (10) Strelets, M., Detached eddy simulation of massively separated flows, AIAA Paper, No.2001-0879 (2001). (11) 古川雅人, ターボ機械における流動現象の知的可視化, 可視化情報学会誌, Vol.23, No.91 (2003), pp. 206-213. (12) Sawada, K., A convenient visualization method for identifying vortex centers, Transactions of the Japan society for Aeronautical and Space Sciences, Vol. 38, No. 120 (1995), pp. 102-116. (13) Furukawa, M., Inoue, M., Saiki, K. and Yamada, K., The role of tip leakage vortex breakdown in compressor rotor aerodynamics, Transactions of the ASME, Journal of Turbomachinery, Vol.121, No.3 (1999), pp.469-480.